Deutschstunden fangen wieder im April in der SRPA an. Realising just how difficult it is to grasp the whole concept of gender and case in German and then, on top of that, having to make the adjectives agree as well, I’ve come up with a knife, fork and spoon guide to der, die, das. Please see what you think. I hope it helps. For those students following the career of Neil McGregor as he seeks to enable the Humboldt Forum to establish a German museum in Berlin, equal in stature to the British Museum under his directorship, the following http://www.welt.de article will be of interest. Thanks to Henning Wehn, those of us who went to see his stand up comedy performance at Lincoln University’s Engine Shed on Saturday evening have been hummimg Ballade pour Adeline ever since. That’s because Henning has convinced us that Richard Clayderman is the resident pianist at the service station on the M6-toll , where a better class of driver is known to take rest stops. Don’t get it? Guess you had to be there. Anyway, just because, you can enjoy it too if you follow this link. Thanks to Richard’s thought-provoking and memorable expositions of the ins and outs of German grammar, members of our improvers class now refer to ‘direct objects’ as ‘victims’ of the verb. Whenever we detect the presence of one of these victims we automatically put them into the accusative case. When it comes to prepositions, such as ‘in’ which can take either accusative or dative case, depending on meaning and context, we talked about going in die Kneipe (accusative) as opposed to meeting our friends in der Kneipe (dative). For Richard, inspiration struck again. ‘Motion towards’ and answering the question ‘wohin?’ as opposed to simply ‘wo?’ just doesn’t cut it with him. He had to get his satnav out! So now we remember that ‘in’ takes the accusative, if we need a satnav to get there! Thank you, Richard! 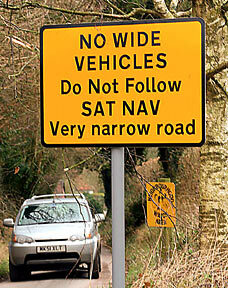 But should we always follow our satnav? This blog has different advice. In Exton (UK) wurden Schilder aufgestellt, den Anweisungen des Navis nicht zu folgen. Hintergrund: Die Ortsdurchfahrt ist so eng, dass Brummis regelmässig Probleme verursachen, weil sie nur ihren Navis vertrauen und nicht auf die Beschilderung achten.